”Cha Khao Hom“ is Thai language and in English simply means ”rice tea“. However, it is not a Thai version of Genmaicha and also not procedure of manufacturing an infusion beverage from rice either, but much rather an exclusive Thai tea specialty that like this is not available anywhere else in the world. In fact, Cha Khao Hom Rice Tea derives its particular taste – an intensive rice taste – not from a scenting with rice, as one would inevitably assume when trying, but from adding a special herb named “sticky rice” that is native to north Thailand, Burma, China and some other south east Asian countries during the tea’s processing, or more accurate during the heating of the tea leaves. We have been able to locate this herb in some Chinese language dictionaries, where it simply translated with the English term “sticky rice”, a term that is usually reserved for a particular way to prepare Thai jasmine rice (especially common in north east Thailand, the so-called ”Esaarn”). However, the use of „sticky rice“ leaves for the scenting and/or flavoring of tea leaves is not completely new. 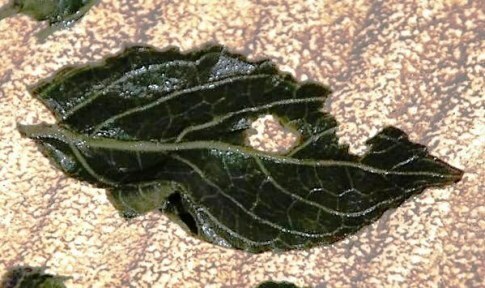 We have found sources indicating that the herb is also being used to scent tea in China, more particular Yunnan (here: “Nuo Mi Xiang Nen Ye“ = ”sweet fragrance rice tender leaves“), but there apparently exclusively for the flavoring or Pu Erh teas, while the scenting of Oolong-style processed tea leaves with “Nuo Mi Xiang Nen Ye“ leaves seems to be a procedure exclusive for Thailand. This doesn’t come as a surprise, though, as for once the origins of the major tea producing ethnic groups in north Thailand (Yunnan Chinese, Shan, and several mountain tribes) can all be tracked back to Yunnan, and second it is Oolong teas indeed that are most characteristic for the tea processing culture in north Thailand, while the production of Pu Erh tea is still in its very beginnings here, though there are signs indicating that could change in the future and Pu Erh tea production could very well soon establish as a regular part of the northern Thai tea portfolio. Whoever tries “Cha Khao Hom“ Rice Tea for the first time and knows the taste of Thai sticky rice, will perceive this naming – as strange as this might appear for a herb – as extremely matching. 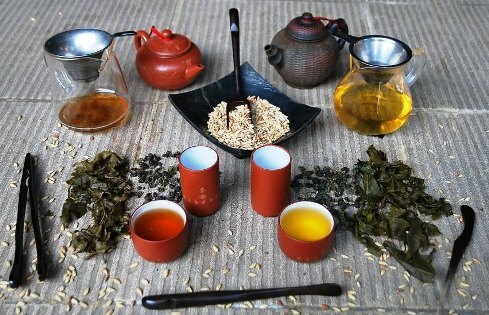 In fact, the taste the tea derives from the herb is virtually identical with that of Thai (or Chinese, for that matter) sticky rice, with one difference, namely that it is a lot more intense: no sticky rice tastes as much like sticky rice as the leaves of the “sticky rice” herb, Nuo Mi Xiang Nen Ye . 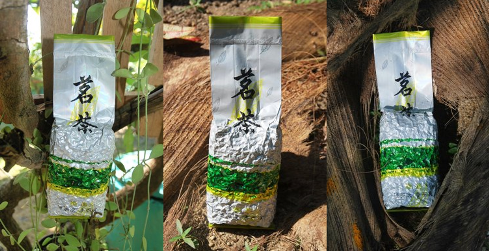 Cha Khao Hom Rice Tea initially became known in its classical version, consisting of tea leaves from the assamica tea tree native to north Thailand scented with the Nuo Mi Xian Nen Ye “sticky rice” herb. 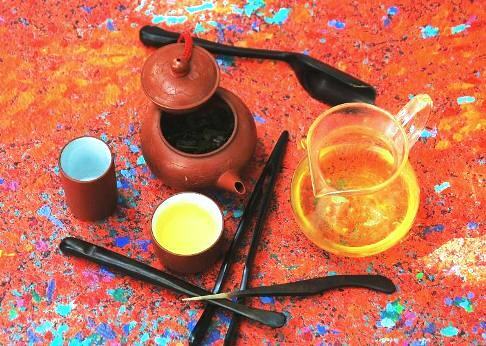 The result is an extremely taste-intense tea, in which the dominant earthy taste notes of the Assamica Oolong combine with those of the sticky rice herb and are even superimposed by the latter to such extent that the tea will appear as too adulterated for man tea “purists”. Nevertheless, this tea has found its fans in the past, and not only within the circles of lovers of scented and flavored teas, but also among passionate tea lovers, who have admitted the Nuo Mi Xiang Nen Ye “sticky rice“ herb into their list of herbs legitimately used to scent Chinese teas, where it is placed amidst the company of reputed flowers and herbs such as jasmine or osmanthus blossoms and ginseng roots, which are also traditionally used and widely accepted as aroma donors for Chinese teas. 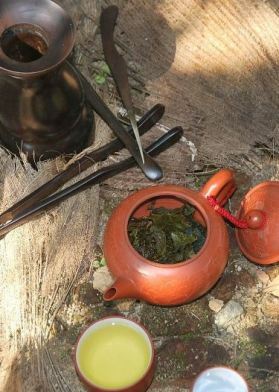 What so far posed a significant difference between the scenting of Chinese teas with Nuo Mi Xiang Nen Ye in north Thailand and other traditional natural aroma donors, was the “decency” of the flavoring, manifesting in the requirement often represented by tea „purists” that such aroma donor may only complement the taste of a tea with a decent, harmonic note, but not significantly or even completely superimpose the same. In order to meet this requirement, northern Thai tea producers have recently developed a “Premium” version of Cha Khao Hom Rice Tea, characterized once by the use of tea leaves from the Taiwan Oolong cultivar No. 12 (Jin Xuan Oolong tea), which is generally considered as rather “fine” and “luxurious” instead of the leaves from the assamica tea tree native to north Thailand for the scenting with the Nuo Mi Xiang Nen Ye „sticky rice“ herb. And second, the scenting of the Premium Cha Khao Hom is done rather decently – compared with the classic version – so that in the result the taste of the tea is not as much superimposed, but much rather complemented in a decent way, thereby creating a completely new taste that will also live up to purists’ high standards and assert both flavors in a harmonious, well-balanced manner. 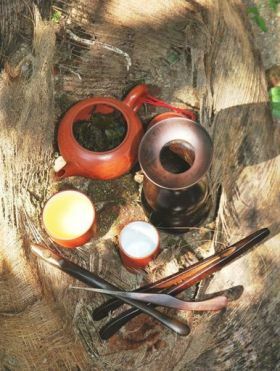 At this, however, the comparative attribute „better“ can hardly be awarded to any of the two versions, as also here “better“ is – as so often and actually always with the rating of a tea’s taste – not only a question of taste, but also one of time and occasion. Even if the Premium version of Cha Khao Hom has very quickly established as a favorite in our own house, we wouldn’t like to miss the classic Cha Khao Hom Rice Tea in our tea shelve – and in our tea pot – at all, as each tea has its time, and each tea has its occasion, where it will be more suitable than another. However, what can be taken for granted is that who used to like the classic Cha Khao Hom Thai Rice Tea, will also love the Premium verion, while the latter will most probably make the scenting of tea with Nuo Mi Xiang Nen Ye new friends in tea lover circles and beyond.